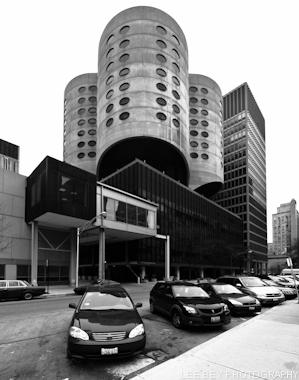 You&apos;ve seen this week&apos;s idea by the New York Times&apos; architecture critic to save the former Prentice Women&apos;s Hospital by building a research tower on top of the iconic cloverleaf shaped structure? The notion has been the subject of chatter in architecture and preservation circles, particularly since critic Michael Kimmelman got Chicago architect Jeanne Gang to flesh out his idea and to create pretty snazzy renderings of the proposed complex. On first blush, the plan shows above-the-box thinking worthy of some applause. Bertrand Goldberg&apos;s iconic modernist structure would seem to escape the bulldozer, which is what Prentice supporters want. 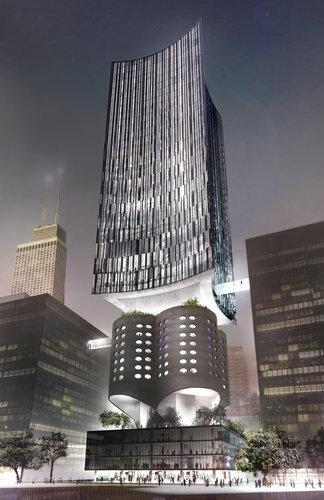 And Northwestern University would get the new research building it wants, without having to demolish Prentice to do it. But as a real solution for Prentice the idea falls flat. Under this idea, Goldberg&apos;s building would be visually overpowered by its taller addition. And what would the cloverleaf towers — now downgraded to being just the midsection of a new complex — do? What is truly being preserved? I would fear the quatrefoils would become an empty concrete Atlas, with much of its original space taken up by structural and mechanical systems needed to support the new world above it. In addition, to elegantly build a 31-story tower on top of a building that wasn&apos;t originally designed to carry the extra load would be frightfully expensive. Yeah, they recently added 25 floors to the city&apos;s Blue Cross/Blue Shield Building, as Kimmelman states, but that skyscraper was designed to be added on — and the finished result is building that looks and functions as it did before. It&apos;s just taller. “It certainly is a very interesting drawing and an interesting concept, but like I said, it doesn&apos;t address the university&apos;s need to have new building connect to the existing building on a floor-by-floor basis and ultimately have a building that&apos;s 1.2 million square feet,” a Northwestern spokesman said. This is not intended as a take-down of Kimmelman and Gang&apos;s idea, though. In fact, their vision has a significant, if unintended merit: It undesrcores the mass public interest in Prentice&apos;s fate and demonstrates there is a wider circle of experts who are thinking of ways to preserve the old hospital. And the Commission on Chicago Landmarks should weigh in now and grant preliminary landmark status to Prentice in order to allow time — and a process — to bring those people and ideas to the table. The preliminary landmark designation would temporarily spare Prentice from demolition for a year. It would give City Hall the ability to examine whether a permanent designation and reuse plan are possible by working with the university, preservationists and experts such as Gang. That process might very well bring the "eureka moment" that saves Prentice, as Ald. Brendan Reilly (42nd) spoke of when he seemingly reluctantly came out in favor of demolition last earlier this week. Or it could reveal the building has no future use at all — which I doubt is true. But at least a deliberative and public process would have been followed.